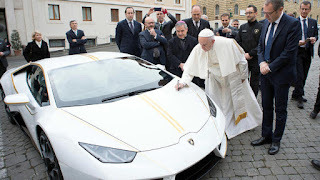 VIDEO: POPE FRANCIS GETS A NEW LAMBORGHINI, WHAT HE DID NEXT WILL SHOCK YOU!!! This video and photos were taken on Wednesday at the Vatican as the Pope received keys to his latest gift, a special edition Lamborghini Huracan. 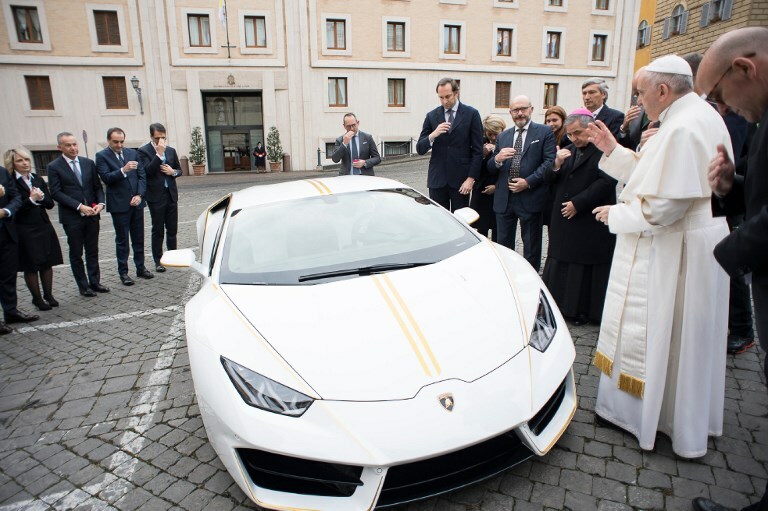 They show the pope autograph the bonnet of the super car whose value is considered to be more than $200,000. According to CNN, The Vatican however plans to auction the Lambo and spend the proceeds to establish a refugee camp for human trafficking victims called "Pope Francis home." Proceeds will also go into building homes and churches in Nineveh Plains, Iraq where ISIS had forced Christians to flee the area. Lamborghini gave Pope Francis keys to a sleek special edition Huracan that will be auctioned off for charities, including one aimed at helping rebuild Christian communities in Iraq that were devastated by the Islamic State group. An Ipad that the Pope once owned was previously auctioned for $30,500. In 2014, the pontiff auctioned an Harley-Davidson motorbike for charity. It sold for $284,000 which was more than 1000% of the normal price. For the Harley’s signed jacket by Francis, it sold for nearly $68,000.